The National Consumer Council may ask for a review of the digital television market after Virgin Media stopped broadcasting some BSkyB channels. The broadcasters were accused of "behaving like children" by the organisation, which is considering making an official complaint. The switch-off came on Wednesday after the deadline passed for the companies to resolve a row over TV rights. The two companies argued over whether BSkyB's higher fees were justified. Virgin is now saying customers who want to leave following the switch-off can do so even if their contracts would not normally allow it. Philip Cullem, deputy chief executive of the consumer council, accused both broadcasters of "behaving like children". "At the end of the month we'll make a decision about putting in the super-complaint that that will help to knock heads together," he told BBC Radio Five Live. "It's time to get them back round a table. Let's have a common-sense solution and one that puts the customers first, rather than all this posturing between two rather big media companies." Talks between the two broadcasters broke down last week. Virgin Media welcomed the consumer group's comments and said that Thursday had been "a bad day for UK consumers". "This dispute is one example of deep-rooted structural flaws in the way the UK's pay-TV market operates," a spokesperson said. "We would welcome a thorough investigation of the causes of this and possible solution by the relevant regulatory authorities and would co-operate fully with any such enquiry." It added it had always been open to discussions with Sky to find a settlement that would allow it to continue providing their basic channels "on fair and reasonable terms", and said that any customers who wanted to leave could do so before the end of March whatever the terms of their contracts. BSkyB argued that the system discriminated against it - as it was dependent on others to allow its channels to be seen by non-satellite audiences. "The broadcasting marketplace in the UK is hugely competitive and dynamic, with customers having more choice than ever before," a spokesman said. "We've invited Virgin to retail our channels directly to customers on its network but it has refused, just as it has rejected our latest offer for our package of basic channels. "We would like our channels to be on cable television, but there's no mechanism to do that [without Virgin's agreement]." Virgin Media had warned it would drop the Sky Basics TV package, which also includes Sky News, Sky Travel and Sky Sports News, if agreement on a new contract to replace its current one could not be reached. Sky One includes popular series such as 24 and Lost, as well as new episodes of The Simpsons. After the channels were withdrawn, Virgin began broadcasting an on-screen jibe at its rival. 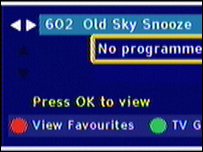 Channel 602, the former slot of Sky News, was labelled as Sky Snooze. However, Virgin head Richard Branson ordered the screens to be removed, saying the firm did not want to be disrespectful to Sky. If you're a Virgin Media customer what are you going to do?